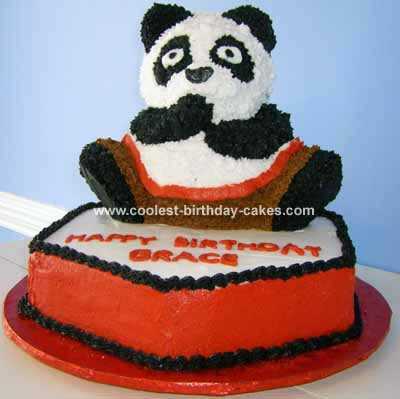 This Panda bear cake was made for a little girl’s birthday party. She really likes Kung Fu Panda so her parents decided give her a Kung Fu Panda themed birthday party. We used the Wilton 3D bear pan for Po (the Panda’s name) and an 8 inch hexagon pan for the base. Both cakes are made from a Chocolate Pound cake. The bear takes one pound cake making and the base takes another. The icing is the basic Wilton buttercream recipe. We thought that the 3D bear would make a great cake topper since the way the bear is positioned it looks like he is doing the splits. There is a scene in the movie where Po is doing the splits while atop a wall eating cookies out of a cookie jar. Decorating the Bear with pants and sitting him on top of the cake closely resembles that scene.